Chocolate bars of a leading brand are made as offering by devotees and they get them back as 'prasdam' after poojas. ALAPPPUZHA (Kerala): Ever heard of a temple where mouth-watering chocolate bars are offered by devotees to the presiding deity? While devotees offer flowers, sandal paste and fruits to invoke divine blessing, the 'Thekkan Palani' Balasubramania temple differs as chocolate bars are offered in the sanctum sanctorum. No wonder, the presiding deity of the shrine located at Subrahmanyapuram on the outskirts of the the town is known locally as " Munch Murugan." According to temple authorities, people, irrespective of caste, creed and religion, come to the shrine with cartons of chocolates, seeking the blessings of Lord Muruga. Naturally, children flock to the temple in large numbers, especially during the examination season. No one knows for certain how or when the ritual of offering chocolate began. "The principal deity in the temple is 'Balamurugan', Lord Muruga as child. Somebody who thought that the child Muruga likes chocolate, might have begun the practise first," temple manager D Radhakrishnan said. He said chocolates are given back to devotees as 'prasadam' like flowers and sandal paste after 'pushpanjali' or 'archana'. Chocolate is also used for rituals like 'thulabhara' along with other traditional articles like flowers and jaggery. A large number of devotees, even those from other states and foreigners, visit the temple with boxes of chocolates. In the initial days, children were those who offered chocolates. But now, devotees of all ages, including the elderly, offer chocolates to the Lord Muruga, he said. The shrine, managed by a 21-member trust, was built by an ardent devotee of Lord Muruga as a family temple decades back. He was frequent pilgrim to the famous Muruga temple in Palani in Tamil Nadu. The temple lore has it that Lord Muruga once appeared in his dreams and asked him to build a shrine in his village. The shrine was recently renovated to improve facilities in view of the rush of devotees, temple officials said. 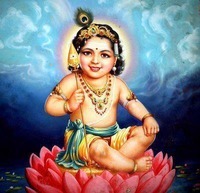 Murugan or Kartikeya (also called Subramanya) is the son of the lord Shiva.